Performers include: Dylan McDermott, Maggie Q, Victor Rasuk, and Mariana Klaveno. This psychological thriller follows detectives of the LAPD’s Threat Assessment Unit who investigate incidents of stalking — voyeurism, cyber harassment and romantic fixation. 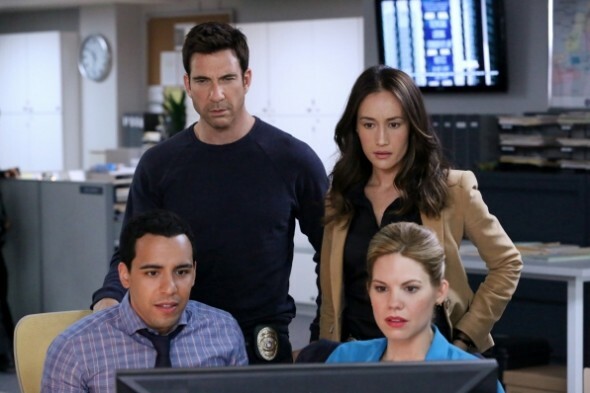 Detective Jack Larsen (Dylan McDermott) is a recent transfer to the Unit from New York City’s homicide division. His confidence, strong personality and questionable behavior has landed him in trouble before however that past behavior may also prove valuable in his new job. His boss is Lieutenant Beth Davis (Maggie Q) — a strong and focused expert in the field. She’s driven by her traumatic personal experience as a victim. The two work with young and eager Detective Ben Caldwell (Victor Rasuk) and deceptively smart Detective Janice Lawrence (Mariana Klaveno). Larsen and Davis and their team assess the threat level of cases and respond before the stalking and intimidation spirals out of control — all while trying to keep their personal obsessions at bay. A search for an elusive serial killer leads the TAU to a shocking revelation. Also, Vicky learns some startling information about her ex-husband. What do you think? Do you like the Stalker TV show? Do you think it should have been cancelled or renewed for a second season? Stalker: CBS TV Show Returning Soon? Stalker: To Be Cancelled or Renewed for Season Two? WHY was this cancelled? I loved this show! I’m not the only one missing it! Why was it canceled in the first place. It was a good show with a great cast and storyline. Had hoped that you would bring this show back. Stalker was the best show ever on television. Most shows you can guess the outcome. I loved and miss the series. It needs to come back! Me my mom and my sister use to watch this together faithfully. I Dont understand why the network always cancel the good shows. We waited, and waited, and waited till we got the heart breaking news. I just found out today that Motives came back. So i thought maybe it could happen for stalker. Man, was i disappointed. We LOVED the characters and the MUSIC… please give it one more shot. Network gave scandal another shot and ppl finally caught on. Give people time to catch on. It’s in the advertisement. Can’t watch what we know don’t exist. Thank you. Please bring Stalker back, fantastic casts, good story lines and super actings, and CBS decides to cancel it, what type of people run the TV co..! !